June Exams: Assessment or a Rite of Passage? I don’t know about you, but I am in the thick of exams. At the Senior Years level, we have been using exams as a huge summative assessment piece intended to perhaps supply a bookend to the year and establish some sort of “rigour” within the learning process. I recall this process during my High School career: cold gyms, desks in long rows, hovering music teachers who were forced to invigilate the exam, long sheets of foolscap paper, and deformed extremities which were overcome by writer’s cramp. In 1993, I wrote my last exam in the Kelvin High School gymnasium, but very little has changed 20 years later. A few days ago I was invigilating the Grade 11 Canadian History exam at my school. As I was walking up and down the same long rows of nervous and stressed out students, I began to question this bizarre ritual we perform each year at this time. Why do we have students all write in the gym? Is there pedagogical value in this? Why do we suggest to students that we will assess their learning and provide them with 20 to 30 percent of their mark based on three hours of writing? In what other part of life do we place people in long rows in sterile rooms and expect them to be creative? Right, post-secondary education. All of these questions began to swirl in my head and I knew I really needed to do some reflection. So why? Why do we create these sweatshops of assessment? I suspect that the main value is twofold: Firstly, there is the basic efficiency in terms of supervision. 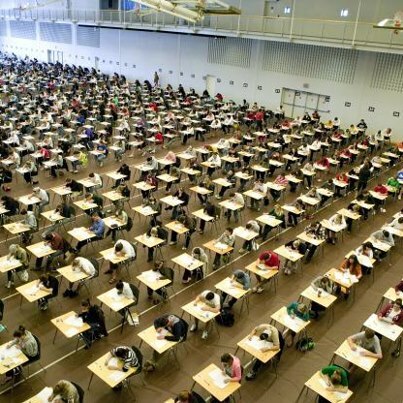 Holding exams in huge rooms allows us to use fewer teachers to ensure that students are not cheating. But what if we turned our understanding of summative assessment around and changed how we perceive it? Williams and Wong (2009) suggest that open book and open web exams can provide even greater learning and assessment opportunities when applied appropriately. By this, gymnasium exams and end-of-term exams change philosophically and physically. More on this in a second. Secondly, I think we like to pretend that the anxiety we create by corralling students into a large room ensures that learning has been rigourous. I am not sure about this (See my thoughts on rigour). The only rigour or challenge I saw in the environment and the act of this type of summative assessment was the actual physical space and the stress of trying to cram as much information into short-term memories as possible. It would seem that the final exam has become a ritual of compliance and a rite of passage. So then what is the point of having students even write exams of this nature in the first place? Why are we asking them to write about what they know of a subject in three hours? Why do we base 30%, sometimes 100%, of their assessment on this short moment of time? What if we changed our understanding of summative assessment and provided students with the opportunity to truly apply what they have learned? I am not suggesting that we move to a strictly formative assessment structure, rather that our summative assessment becomes meaningful and allows students to offer a nugget of truth and/or knowledge to the world. I suspect by taking them out of the gym might be a first step. The next is to look at what we are assessing. Ken Robinson, in his most recent TED talk, suggests that education is about creativity and curiosity. Perhaps final exams should be measuring curiosity as a primary outcome. In order to this, however, we might have to change the our methodology for assessment. Recently I had the opportunity sit down with my good friend Andy McKiel, curriculum consultant with the St. James-Assiniboia School Division and Dean Shareski of Discovery Education. Amongst other topics, the discussion found its way to the notion of assessment. We discussed the limitations of final exams, in particular multiple choice exams, and how these are designed for short-term memory assessment and often purely based on lower-order thinking. As we often do, we found that our conversation resorted to the basics of education: What is learning and what does excellence in teaching look like? If we struggle with these on a daily basis, both personally and as teams, I think we might be able to do better than exams as isolated pockets of short-term memory and/or rites of passage and masked attempts of rigour. If we see exams as summative assessment of curiosity and action, we might better be able to assess for the application of skills and knowledge, and ultimately the creation of new knowledge. New ideas, I would argue, rarely come from looking at the back of someone’s head in a gym or on a plane, but rather in groups, in the shower (when we’re blue-skying, and washing), and when we have a real audience. It is my contention that we need to move away from preconceived notions of rigour and towards, as Wraga (2011) suggests, a “vigorous educative curriculum.” Let’s move from rigour to vigour. Tests and exams can also be learning tools. Dylan Wiliams (1998), the guru of assessment for the past 15 years or so, suggests that “Class tests, and tests or other exercises set for homework, are also important means to promote feedback. A good test can be a learning as well as a testing occasion. It is better to have frequent short tests than infrequent and longer ones. Any new learning should first be tested within about a week of first encounter, but tests more frequent than this are counter-productive.” So if summative assessment tools can indeed by learning tools AND that they should happen immediately following instruction, what purpose do our traditional end-of-semester exams serve? Also, how often to we get to review a final exam with our students and suggest ways of improvement or offer praise? Now I am by no means suggesting that we rid ourselves of final exams. I am also not suggesting that AP Calculus exams become cute and cuddly group work sessions. Not at all. I am just asking that perhaps we stop and think about how final exams in gymnasiums might help or hinder learning.